Fire crews are trying to determine if a house fire in the Old City was started by a cigarette. Firefighters were called to the 1400 block of Armstrong Avenue around 6:00 Saturday morning. 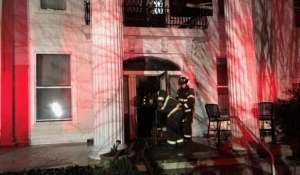 Flames were coming from the center balcony of the historic home. The residents were safely evacuated and the flames were extinguished. Officials believe the fire may have been caused by a cigarette one of the residents snuffed out on the wall of the balcony.